Before I came to Canada, my first instinct would have been to run from a bear. I think I even read it somewhere that depending on what kind of bear you encounter you should run. I cannot remember which one it said to run from but knowing better now it would be a bad idea to run from either. Before I came to Canada I thought bear spray was a silly joke like asking someone to go and get a glass hammer. It’s amazing what you don’t know until you need to know it and misinformation can be a very dangerous thing. It is always a good idea to get an expert opinion and take advice from people who live in the back country before wandering into the wilderness unprepared. 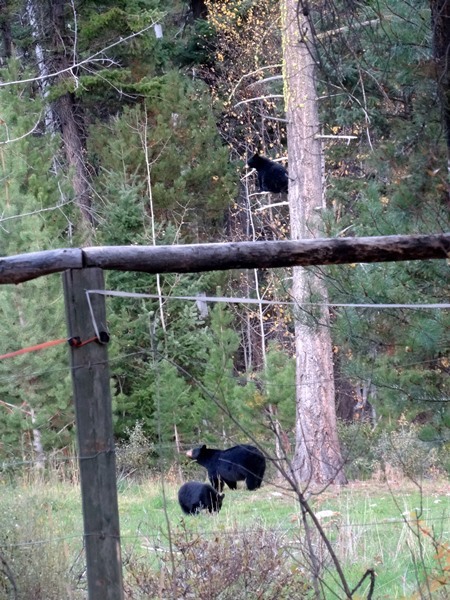 At the Ranch we all watch a bear safety video and have a bear safety orientation before venturing out of the grounds. The bear orientation deals with how to use bear spray and bear bangers safely and effectively. The bear safety video goes through the difference between a grizzly and a black bear and what you should do if you encounter them; different bear, different plan of action! So why is it a bad idea to run from either bear? Well basically because you can’t outrun them, Usain Bolt couldn’t even outrun them! Grizzly Bears (the slower of the two) can run up to 30mph, Usain Bolts top speed is 27.8mph. Black Bears are even faster and can run up to 60km/hr or 37mph. When you run a bear thinks you are prey and will continue chasing you, so stand your ground, as unnatural as that may seem to you. Despite what you have heard bears can run on any terrain, up or downhill and they can also climb very well. Black bears may be better and faster at it but grizzlies will also climb after you if they feel the need. The advice they give is to travel in groups; the larger, the better when in the back country. Talk or sing to alert bears of your presence, most of the time a bear is more wary of you and wants to avoid an encounter as much as you do. Carry bear spray and know how to use it. Do not approach a bear especially if it is with cubs or at a food source, they will defend them if they feel threatened. Know the difference between a grizzly and a black bear and act accordingly. It is also important to pack out any food or garbage you bring with you, everyone should be vigilant in preserving the natural way of life in the wild. Bear attacks are extremely rare. Although there are thousands of human-bear encounters every year, only a very few result in injury. Most bears will actually retreat before you are even aware of their presence. It is still important, however, to stay alert and know what to do.